Mention in the New York TImes | When Do They Serve The Wine? The New York Times is my favorite paper, so when they mention me and my work, it is a thrill. In today’s online version (here is the link) , there is a story about all things comic and cartoon (the New York Comic Con is this weekend in the city). The article discusses all the events around the convention…and they mention the show at the Museum of Comic and Cartoon Art. I will be signing books at the Comic Con on Saturday, 2:00pm table E 10. This is the cartoon that was published in The New Yorker a few weeks ago, and the Times quotes as a “typical” Donnelly. I don’t hate men (as some may think); in fact I am married to a wonderful one. Some of my best friends are men. But there are women out there who would say this….and it’s my job to create people. 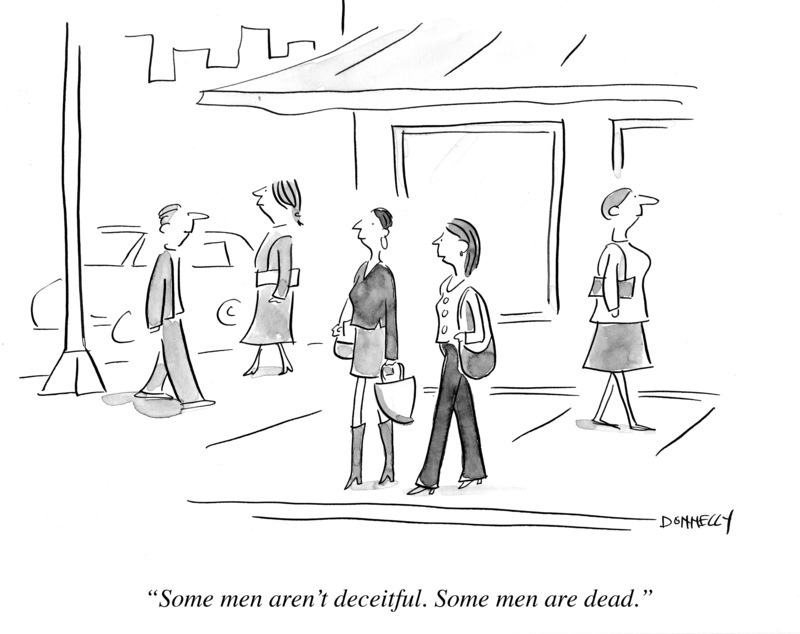 The cartoon could just as easily be flipped, with two men talking about women. This entry was posted in News and tagged Art, comics, Museum of Comic and Cartoon Art, New York Comic Con, New York Times, The New Yorker. Bookmark the permalink. If the cartoon was flipped, and it was drawn by a male cartoonist, and you saw it, would you assume that he was just creating a character, and not expressing his own opinion? Yes, I would. But as I think more about it, flipping that cartoon would be problematic, and have hints of abuse. Not that women don’t abuse, but you know. Brings up a lot of questions about who to make the speaker in a cartoon and why. anyone who says a cartoon is typical of a cartoonist doesn’t understand cartooning. Agreed. The media–even the Times–likes to simplify.